I knew the Minecraft Steve Diamond Armor Toy was a must have for me because not only is the normal Minecraft Steve toy fantastic but, who wouldn’t want Steve all geared out in Diamond. He’s a cute action figure with many uses and I love him. This version of Steve reminds me of when I played Minecraft most during college. The first times I encountered diamonds and was finally able to make some new equipment. And then once they added enchanting to the game, mining became even more fun. You know with the Unbreaking and Efficiency enchantments to mine extra fast for even more diamonds. Mining was my chill out time away from homework and studying and I remember those relaxing times fondly. Steve here makes me think of those times so that’s a plus right off the bat. I really do like the figure. It’s well made and simple. I love the look of it just like Minecraft with bright colors. It’s a great display piece for my desk. If you like Minecraft and you love to collect, this is a great toy to pick up. #1: Diamond Armor Steve is an officially licensed toy. This means that he is a high-quality action figure. You know you aren’t getting anything poorly made and cheap. He comes in as a good deal and a great buy. There are actually 2 accessories that come with Steve. One is his Diamond sword and the other is a Diamond Ore block. There’s a lot of articulation on this figure for how small it is. Steve’s head moves from side to side. The hips can swivel a little bit for some extra movement. His arms and legs also move back and forth just like your characters do in Minecraft. Sometimes figures are overly complicated. Companies are making them with cheaper materials and they don’t come out as great. This toy is perfect. The design is simple and well made. Good enough to make it a display piece in fact. No over the top features. It does exactly what we need it to do. You won’t need any directions or assembly. And if his arms happen to come off they pop back on with ease. Diamond Armor Steve is a series 2 figure. In total, they’re making 3 series. Each includes their own set of different characters in addition to accessories. As a result, there are a lot of figures you can add to your collection. So if you’re obsessing over Minecraft and toys like me, this is a great feature. How close is it to the source material? When you’re looking to buy a Minecraft toy you’d expect it to look just like the characters from the game right? Everything included here is exactly that. It feels like it came straight from the game. The diamond ore block will still fill you with excitement just like if you found one down in the mines. And the diamond armor, of course, will give Steve great protection from all of the bad guys. I love that they didn’t change it up too much. The Minecraft Diamond Steve toy is wonderful. How does this Steve toy rank against others? One other similar toy is the Vinyl Diamond Steve toy from Jinx. That toy is a bit more cartoony looking in my opinion. It has a ginormous head and also comes with a diamond sword and removable helmet. It is double the size at 6 inches tall. The box is a little bit nicer too. All that said I still prefer the Minecraft 3 inch Steve action figure. It has a more simple design and clean look. It also matches much more closely to what Steve looks like in Minecraft. I just think the proportions look better on the 3 inch Steve. 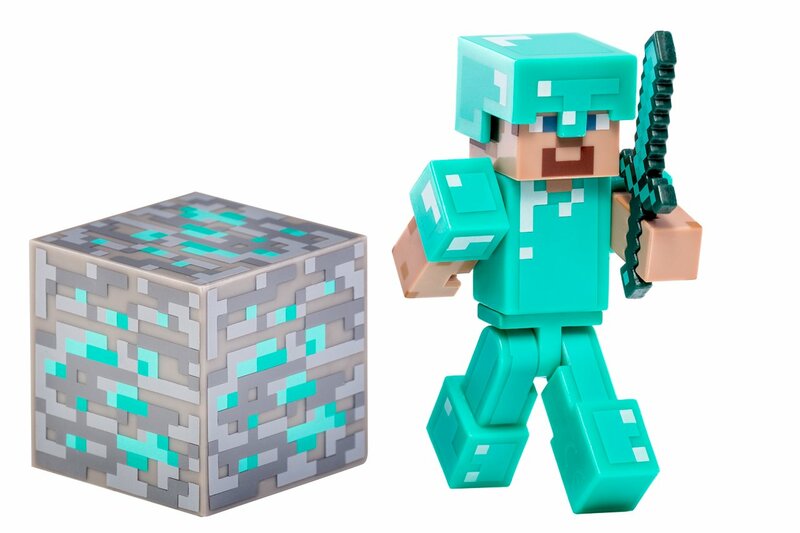 Diamond armor Steve is an officially licensed Minecraft toy. That means the makers of Minecraft have put their stamp of approval on this figure and allowed it to be made by Jazwares and sold by Amazon. And generally, that means the toy is of good quality. The toy is actually pretty small. Not the smallest figure out there but, also not close to the biggest either. It’s actually pretty durable despite the fact that it’s not a heavy toy at all. I think the height of this action figure makes it the perfect display piece for a desk or on the shelf. Especially as part of a collection. This toy comes with two fantastic accessories. One is the diamond sword which fits into Steve’s notched hand with ease. And the diamond ore block which works like a charm as a display stand. In addition to those, Steve’s helmet is also removable so that’s sort of like a small bonus accessory.